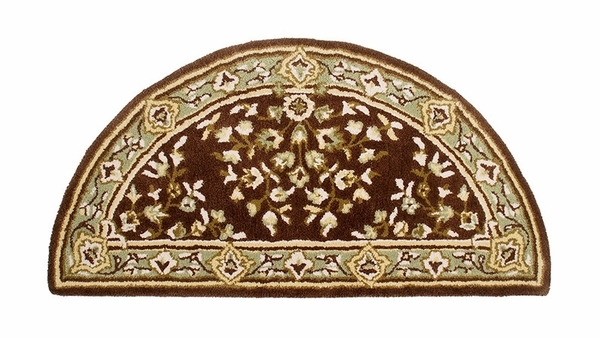 This coffee colored half moon hearth rug will accentuate your fireplace with elegance. The Persian design has the traditional borders and floral motif in the center. Because they're woven of 100% virgin wool, it meets the federal requirements for surface flammability. A quality made rug that will last a long time. The colors are so lush and vibrant that you will want to purchase several in different sizes, shapes or colors for other rooms in your home. It's a great hearth rug to protect your floor from flying sparks. Only used for indoor fireplaces. Check out our other colors and shapes.